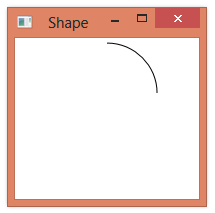 We can use a StreamGeometryContext to render some geometry in a custom Shape element that we can then use in XAML. Below is an example that draws a simple arc from 0 degress to 90 degrees. It uses a PolarPoint class to allow describing the arc start and finish as polar coordinates. (A future post will allow a user to specify arc start and end). false,   // greater than 180 deg?